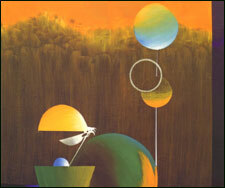 Exhibition Of Paintings By Ravi Gossain is an event that took place between 05-Dec-2006 and 17-Dec-2006 in Hyderabad. So IITians can paint too. Or maybe, as Gossain would like to put that, painters can be IITians too. Chitramayee - State Gallery of Fine Arts is organising an exhibition of paintings, themed Celebrating Space, by senior artist Ravi Gossain, from 5th to 17th December. Gossain is an alumnus of IIT Kanpur, with 25 years of experience in the corporate world. This exhibition contains 60 paintings, large and ambitious. Some strategies are familiar, such as his penchant for using certain rounded balloon-like symbols as a potent form. His works reflect the precision of geometry, the power of symbolism and the impact of color. He blends science and art in bright colors. The end product is always a dream image with bright and eye-catching contrastive colors. Gossain has been painting for 20 years, primarily for himself. It is only recently that the art world has seen his wonderful work. He has exhibited his works at the Lalit Kala Annual Shows, and had solos at IIT Kanpur and at the Habitat Center. He is also a guest faculty member at IIT Kanpur for the Masters Degree in Design. Fot further details, please contact the art gallery at 2311-3308/98486-66262. Be the first to comment on Exhibition Of Paintings By Ravi Gossain! Just use the simple form below. fullhyd.com has 700,000+ monthly visits. Tell Hyderabad what you feel about Exhibition Of Paintings By Ravi Gossain!